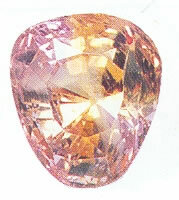 Padparadscha is a very rare, pinkish orange sapphire. It is the only variety of corundum other than ruby that is given its own name, rather than being referred to as a sapphire of a particular color. The name derived from a Sinhalese word, meaning lotus blossom. It has got very high projective energy and is connected to Shiva, which is also an aspect of divine fire and purification. It gives positive life force qualities; it activates and vitalizes the whole body through the circulation of the bloodstream. It has a heating and stimulating vibration.